Aluminum Octagonal-Truss(tm), 4 CRS(tm) Polyester Walls, Pinch-Proof Release Levers, Vented Peak, Fire Retardant CPAI-84, Cool Silver Undercoasting. Curtain Wall Suspension (CRS) walls suspend from a rail, can be zipped to a full enclosure, pleated at the corners, or one, two or three walls can be used for a unique arrangement - all Velcro Free. Commerical Grade Aluminum Frame includes Strong Octagonal-Truss(tm), 1 and 1/4" square legs, Radial Inner Truss reinforcement and Internal Chambered Truss Bars for years of dependable usage in the field. Popular 10' x 10' size. Made with CPAI-84 Fire Retardant polyester fabric. Under 2 Year Manufacturer's Warranty. UnderCover understands the importance of flexibility, which is what makes their Curtain Rail Suspension (CRS) system so great. Set up your canopy as you normally would and then the CRS system lets put up as many walls as you like. Want a full zipped up enclosure? Or do you just need a back wall? You can configure the walls as you need to - all without dealing with Velcro straps. Add in the UV-blocking polyester cover, height adjustable frame and pinch-proof release levers and the 10x10 R-2 is raising the bar for canopies everywhere. What is the difference between a professional-grade canopy and a commercial grade canopy? Professional and Commercial canopies are considered the same. They usually require top material to be at least 300 Denier. This item has a 600 Denier Top. Are these tents and sidewalls good in the rain? This tent and sidewalls is water resistant only, not waterproof. When exposed to heavy rain there will eventually be leakage. If you are looking for a waterproof unit, you can find one here . Thank you for your interest! What is the height of the side wall? These sidewalls measure 10.1' by 8.5'. Is the Flame Retardant Certification Sewn into the tent top? And what denier rating are the sidewalls? The top is CPAI-84 Flame Certified and NFPA-701 Flame Certified, but it is not sewn into the top. The sidewalls are 150 Denier. Are the walls included with this package? Yes and you will love them! So much easier to deal with and beautifully designed when bunched at the corners. What weight will the frame take? The frames for these canopies are not designed to hang items from them, therefore they do not have a specific weight the frame can handle. Does this canopy have UV protection? 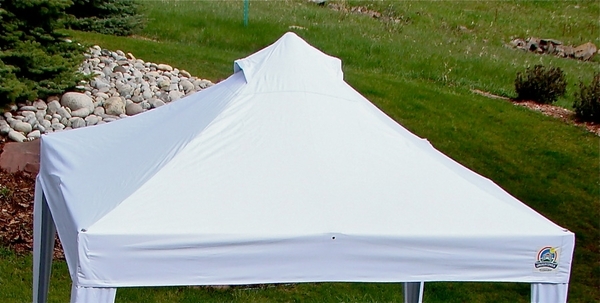 This canopy is indeed UV treated, as it comes with a UV-blocking polyester cover. Do the sidewalls overlap or zip together? The walls are the Curtain Rail Suspension (CRS) system, they hang like a shower curtain on clips from a guide wire. The walls can then be zipped to a full enclosure, pleated at the corners, or one, two or three walls can be used for a unique arrangement - all Velcro Free. Can this item stand on concrete? Yes, it can. 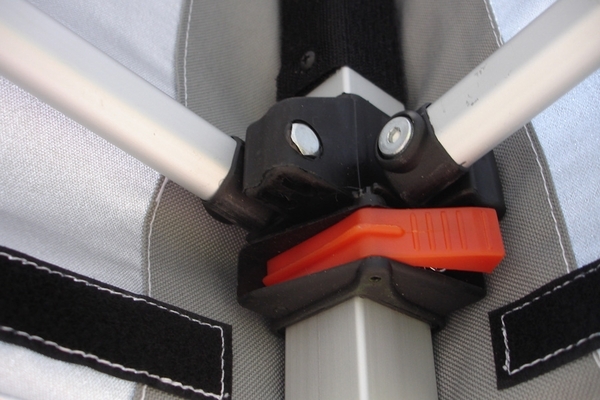 You will need to purchase weight bags to attach to the legs to secure it. When this frame is fully extended, do the side walls reach the ground? When this frame is fully extended, the sidewalls should indeed come to ground length. it is water-resistant, not 100% waterproof. When the tent is folded up, does the top have to come off to fit it into the carrying bag? Or, does the top need to be fitting on each time the tent is used? It is recommended that you take off the top after each use, before storing it, to prevent damage to the top from the frame. What is the height of this canopy when it is folded up and in the bag? 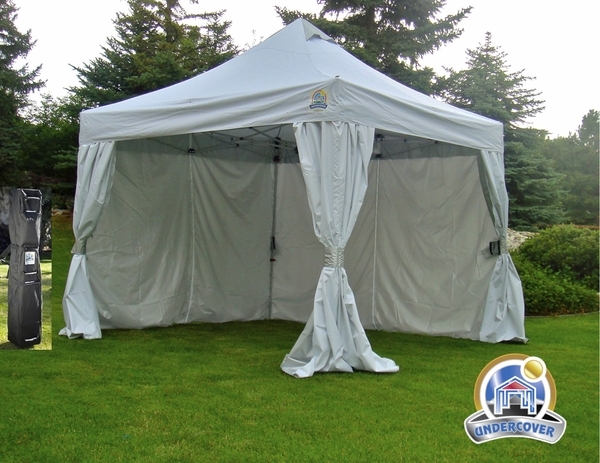 The Undercover R-2 10'x10' Canopy has a folded size of 11" x 11" x 61"
Does this canopy have the silver lining on the top? Do the sides have it as well? Is it vented? Yes, this canopy does have the silver undercoating. The top does have a protective inside silver coating as does the walls. This should keep your tent cooler than many other pop up tent types when you have your three walls up. The canopy has a silver lining as well as an air vent. Do anchors come with this canopy? The UnderCover 10x10 R-2 Aluminum Frame Instant Canopy with CRS Enclosure comes with spikes to anchor the canopy. Does this canopy come with weights? No, it does not come with weights. Do the sides have to be removed to store the tent in the bag? Per manufacturers care, they suggest to remove the walls to avoid tearing the fabric if it should pinch up in the folding frame components. What are the foot plates constructed out of? They are made from a thick, tough plastic material. Does this come with a wheeled carry on bag? Yes, it does come with a wheeled carrying bag. Can this be assembled by one person? What is the weight? This model can indeed be assembled by one person. However, I would recommend two people until you are more familiar with setting up the tent. I show the overall weight of the top, frame, and all accessories weighing 70 pounds. What is the valance height of this canopy? 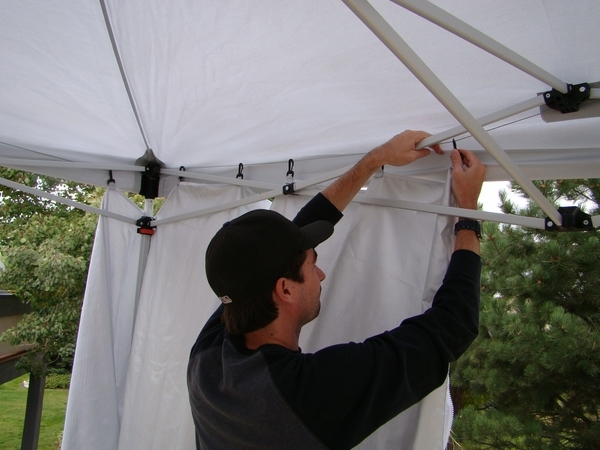 The head clearance for this tent is up to 85". Beautiful and sturdy. I look forward to lots of years of use with this. I love my new tent for shows. Easy to put up by myself. Nice to have a rolling case however it is not quit wide enough to zip it all the way up with the top on it. It was delivered quickly. Love the way I can just hook on the side walls. No velcro! ConsLove having a rolling case however it is not quite large enough to zip it up with the top still on the frame. Recently purchased this to do craft shows. 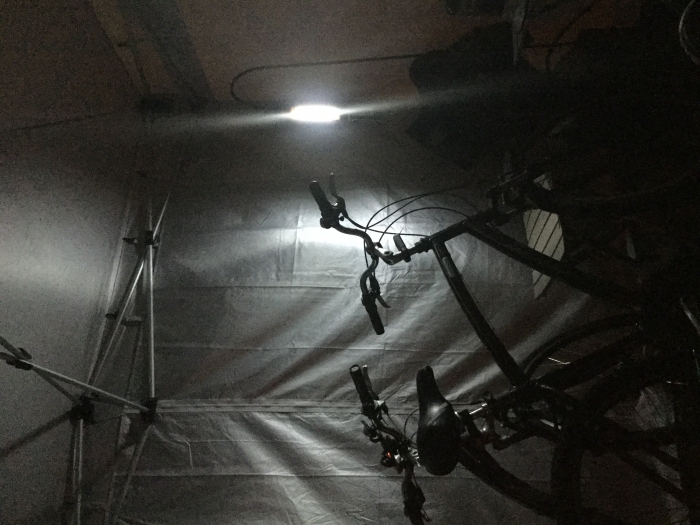 It is very well built, better than my ZShade, and goes up real quick and easy. The sides are great and fit very well. The whole thing is fairly heavy duty and looks great. Got several complments on it right away. We leave it set up overnight and just zip up the sides and no dew or moisture gets in. Holds up well in high winds and is strong enough to hang pegboards full of crafts off the frame. I am very pleased with this canopy. I used my tent this past weekend and LOVE it! My eCanopy is lighter than my last tent but still very sturdy which makes it easier for this 65 year old woman to put up. The walls are designed to open in the center of each side and pull back on a wire system which is a great improvement. There are Velcro tabs to hold back the walls at each corner which when drawn back drape beautifully. The design of the tabs are also attractive when in use as well. I live in Fl so the extra UV lining helps keep the tent cooler in the hot season as well as extra protection in the cooler mornings. With the change in temperatures the tent doesn�€™t seem to sweat like my last one. All in all it�€™s a great tent!! Had a chance to use it this weekend and loved it. 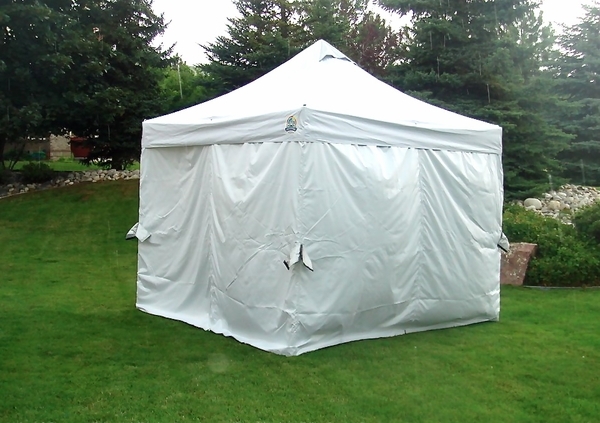 Easy to put up, roomy and kept the weather out! Tent is well built and nice looking. Adds a very professional look to our catering business. Will definitely purchase additional tents. What a great investment and the price point was unbeatable! 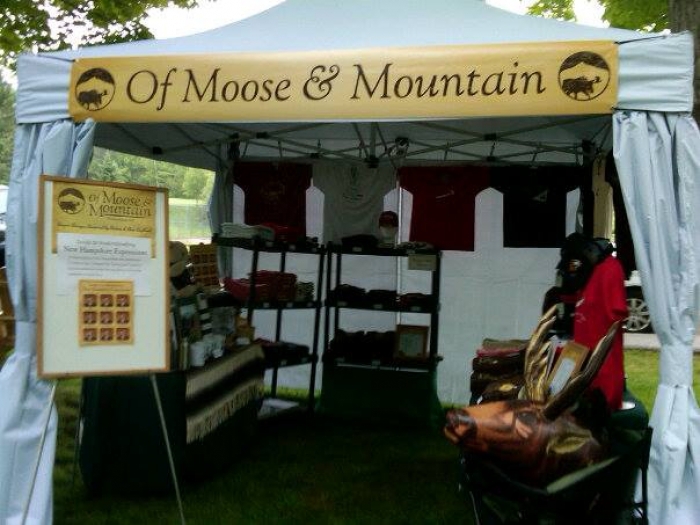 We did our first craft show the weekend of June 22nd and it was a wet one! We sprayed the seams as instructed and had no issues with leakage. Looking forward to our next craft show in July 2018 and many more. Money well spent! ProsEasy to set up and was very impressed with how sturdy built the frame is. This is a well constructed canopy. I tried it last weekend for the first time. It was easy to put up with a single person. This is my second undercover professional and it is the only canopy I will use from now on! They are easy to put up by yourself, very sturdy, and the cable slides doe the sides are the BEST!!! My new canopy has improved reinforcements in the corners and the seams are stitched better than my old one. I did not use the sides for my Prescott Az show last weekend,, but will use them over Memorial weekend at my next show. These canopies hold up well, I usually do 25 to 30 shows a year and they are the best for the price. I do use a marine grade sail waterproofer on my canopy tops, as these canopies leak, especially at the seams,,, but are awesome after 2 coats of sealer. The uv protection keeps this canopy cooler, but one drawback is they are pretty dark on cloudy days. I was very impressed with the setup of the tents. We purchased 2 of them and used them for the first time this past weekend. The went up so smooth and easy. I just wish that the storage bag was a little bigger so we could leave the top on the frame for storage. We had another brand of canopy next to these 2 canopies and you could really tell the difference in the temperature under the different canopies. ProsEasy setup and tear down. loved the walls they are easy to install and remove. ConsThe storage bags need to be bigger so you can leave the top on when in storage. Also larger storage pockets are needed for the sides and top. If you don't fold it just right it won't fit. I am very pleased with my purchase. It is easy to put up and take down. Really like the curtains and how they hang and the many options on how to hang them. This canopy is the easiest to put up and the system for the side panels is innovative. I love this canopy. I only do a few shows a year and was in the market for a new canopy tent. I like the instant canopies, as I have to set up one on my own. This one is easy to set up and I like that it has a vent and four zippered walls with the curtain rail system. I will attend my first event with this one on Saturday. This has to be an engineer's climatic experience. I am amazed at the detail and quality. Very pleased with the design, materials, and workmanship. It is sturdy, beautiful, and well thought out. Someone took the time to work the concept and put Velcro, reinforcements, and flaps in all the right places. It is very easy to get the frame in and out of the wheeled carrying case (we opted to use a small suitcase for the canopy and sides, so we don't have to be so precise in folding them at tear down). It may be a little thing, but am so glad they put easy-to-use snapping devices for raising/lowering the tent and expanding the canopy - so quick and easy on the fingers. 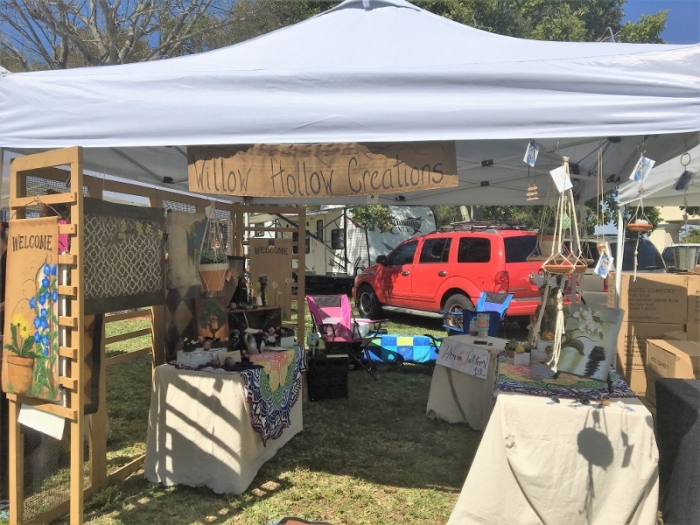 With the clip-on draping sides, we can adapt to individual craft fair tent locations and end up with the visibility we want and an elegant look. I would buy it again and recommend it to a friend or relative. ProsSeams to appear sturdy. Canopy feels like good thick material. Draping sides make it very easy to get the desired visibility. Nice looking, has a touch of elegance. Held up well in a stiff breeze (with leg weights). ConsOne canopy's clip push-button cover broke off on my second set-up. It was my fault for inadvertently pushing the button without the clip inserted. The clip works 100% well without the little cover piece. I saw one of my friend's purchased this tent. I watched! Then, I purchased the same one. The look is fabulous- looks dressy. The sides work so easily; I love the cable set-up for the sides. I found I need to practice opening it up or to put some WD on the legs. Take down was so easy. I had the legs spiked and the tie downs and experienced no wobbling. ProsMy thoughts: nice looking, no wobbling, it's easy to open and easy to close. The silver lining- keeps you cooler. The vent at the top is great. The tent is very easy to set up. My husband and I are in our sixties and don't have the upper body strength we used to and this tent worked well in this aspect. Pros..Love the sidewalls; I am short so having roll up and down side walls was impossible if I was doing a show alone.. Having the walls which work like a shower curtains allows me independence. ConsThe only con we have experienced is the tent is hard to put back in the canvas with the canopy on which we could do with the easy-up. We also got a rolling suitcase to transport the side walls. I have been doing outdoor art shows for several years and when my beloved three year old EZ up was bent in a wind storm, I decided to up grade. I love the new tent; it was as easy to up as our old tent and hanging the side panels was much easier then Velcro-ing the ones in the old tent. We can fit the tent with the top on back in case and we folded all of the side panels into rolling suitcases... Very easy and I feel more secure and professional now. I had this canopy fully assembled and set up (other than side walls) by myself within 15 minutes of it being delivered. It set up easier than the couple other canopies I have used. Tear down and repacking is almost as easy. It's a snug fit in the case but it does fit. I have now set it up and repacked it 5 times - 3 times by myself and twice with help. 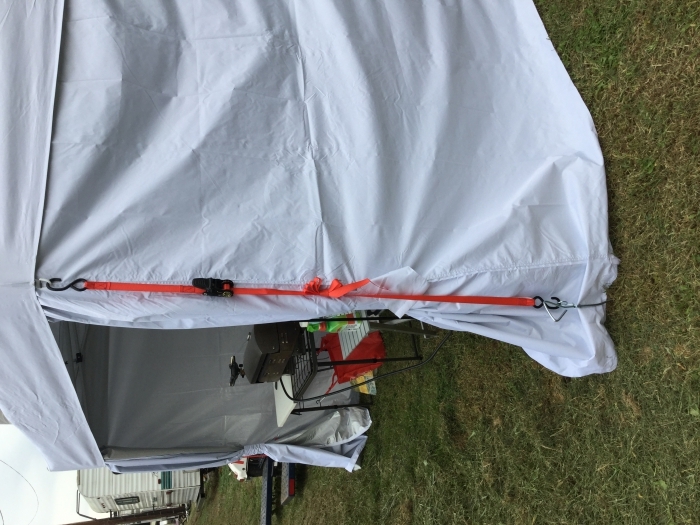 The curtain walls were a hit with other vendors at a show last weekend and provided lots of options for keeping out the drizzle as well as hiding the legs. It's packed size is larger than a lot of canopies I have used/seen. We had to transport it to the show lashed to the roof rack of our Subaru. Dealing with eCanopy was one of the best customer experiences I have had in a while. Ordering was easy. The price was good. Shipping was faster than expected. I ordered Saturday night and had the canopy Friday afternoon at no extra cost. The day the order shipped, they emailed me to let me know and sent a link to the owner's manual so I could review it before arrival. Within 15 minutes of delivery, I received an email from eCanopy letting me know it had arrived. I will definitely recommend UnderCover and eCanopy to other vendors. l used to do trade shows in my last company. I remember EZ up tents as easy to put up and take down. My wife and I bought a Gazebo for the back yard and in one winter it was crushed from the snow. She was about to buy another and I was going to have to assemble and disassemble each season. I thought of trade shows and started looking. We only seek shade for our newborn in the backyard and needed nothing fancy that would break. I was actually pleasantly surprised when I found one that provided shade, had walls to close and was open based on needs. Also, the price, for how durable it is, was exceptional and better than the actual Gazebo we bought that lasted only one season. This will allow us to use it all summer with our patio furniture, take down for the winters, and store. I can also bring it on camping trips. It came with great instructions and extra parts for when hardware becomes lose or lost. It is very solid and we are enjoying it already... easier to put up than a bolt together permanent one that won't last anyway. Well worth the investment for an active family. This canopy is perfect! 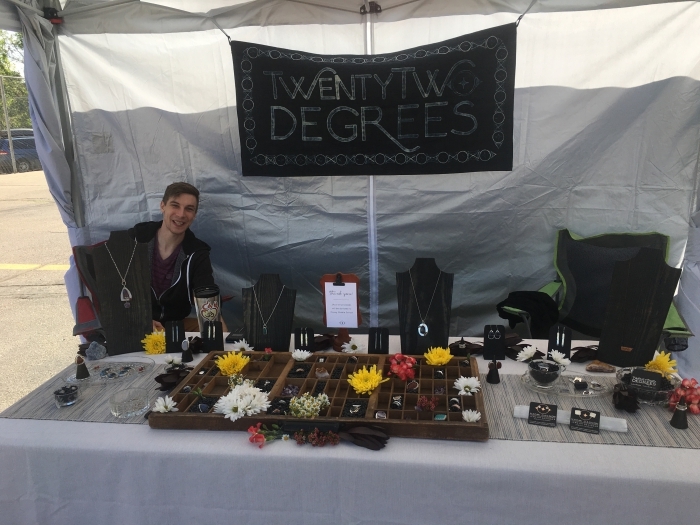 I make and sell jewelry at shows, and could not be happier with my canopy. It's easy to put up, take down, store and transport. Thank you!!! I used this tent for the first time for a show in Florida. A very sunny and breezy day. The tent provided plenty of shade and held up great to the wind. It was so easy to put up! I've been using a tent of less quality for so many years, I had no idea they could go up and down this easy. The canvas is of a great quality and will wipe clean easily. ProsThe canvas is of a great quality and will wipe clean easily. ConsDifficult to fit the canvas top back in the back after use. Easy and fast...best of all it's the best looking set up out there. We needed another canopy for camping. I wanted something with a vented top and my hubby wanted something with sidewalls. On my search I came across this canopy with both features. I ordered it. It shipped and came within a week. I am a 61 yr old grandma and I put it up alone with no help. Amazing product! It is well made and the sidewalls with zippers are very nice also. I have had it up at our campsite for a few weeks and with the tie downs we always use, it has been rained on and not blown away. ProsVery well made. Easy to put up and take down. Love the way the sidewalls tie back instead of roll up! I can put my grill, chairs and 2bicycles inside when camping. ConsNot as waterproof as our old EZup, however, nothing is waterproof in a very hard rain. I was skeptical about the ease to set up, I even postpone the setting up of the canopy because I thought I would need another person. I remembered the review I read about this lady who was about 5 ft tall and she was able to set one up. So, I started and am so happy I did. It was so easy and I still can't believe how easy it was. I really like it and it perform far beyond what I expected. 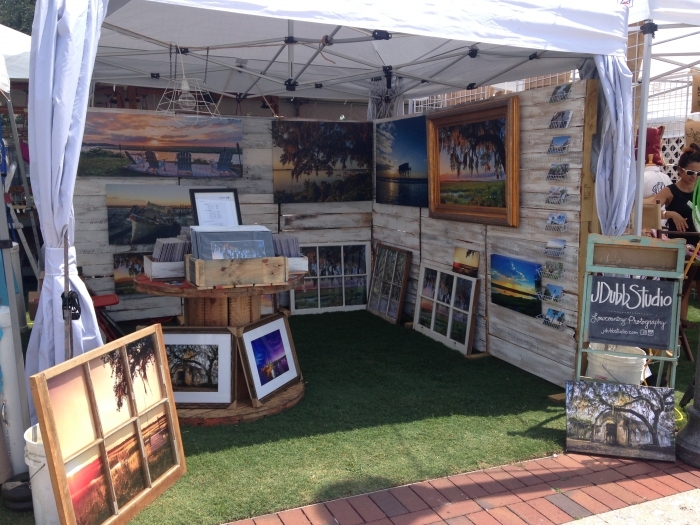 I used my new undercover 10x10 canopy this weekend for an arts and crafts show. It went up easier and was of better quality than my previous one. I did it all by myself with no problem. The sidewalls fit well and go up and come down easily. I like the option of the vented top. I will be using a waterproofing spray as recommended since we had rain and I saw where the top drips.....great product and a good decision. I researched various canopies and looked at what other vendors had purchased and got their opinions and this one fit my needs very well. I am able to put this up by myself. The corners lock in with some effort but are not unreasonable - I also have 2 EZ up tents which take more effort to lock the corners. With 40#stand on each leg withstood a small thunderstorm easily. ProsTop fabric is acceptable thickness and better than my EZ up tents. Zippers in the walls work well. ConsIt would be nice to have more stakes to secure the sides. During the storm the walls flexed and knocked over a shelf that was too close. I just purchased some stakes to take care of this. I purchased this particular easy-up to use at Renaissance Fairs because of the wired perimeter & we can hang any sort if material we'd like (purchasing other type hanging clips). So we take a 21st century easy-up & make it look like a 16th century tent. 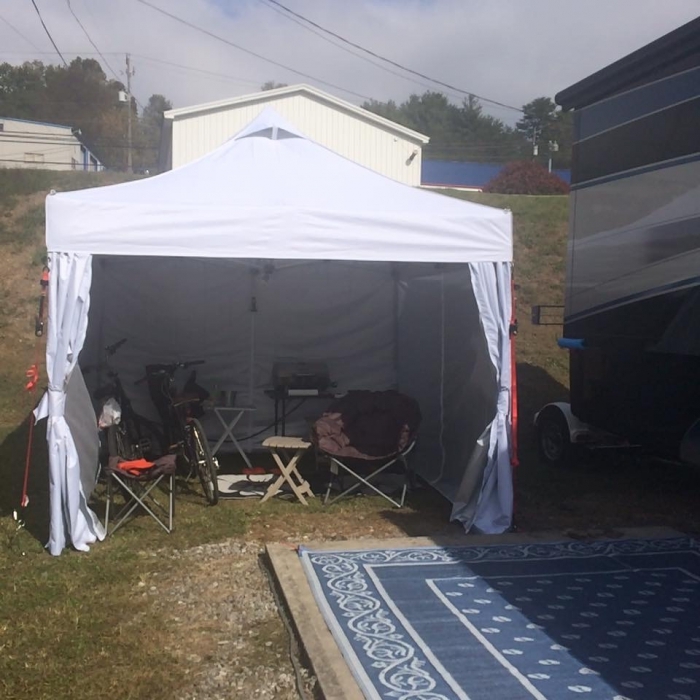 Our group purchased a second one so we now have a uniform encampment. See the added pics as what we create is really fantastically wondrous. ProsEasy easy oh did I mention easy. I being only 5' put everything on ( we drape material over the cross members to hide them so the tent looks of the time period) including the walls before I raise it. ConsIt does pocket with water when it rains especially heavily but we kept emptying them with a broom. GREAT Canopy, but NOT good in heavy rain! ProsLooks GREAT and VERY easy to set up! I love the sidewalls! ConsDoes not withstand heavy rain AT ALL. It WILL leak through. This is the third canopy i have owned, the first Undercover. I will most likely never buy another brand as this one has held up great at my first show this summer. 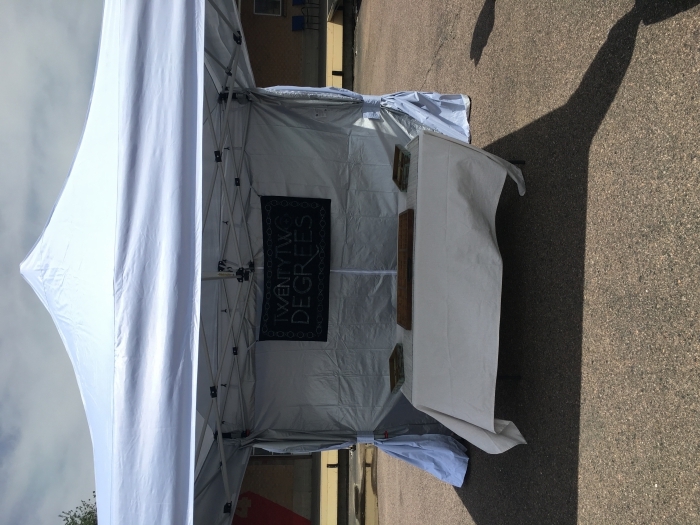 (outdoor 10 day show) Other vendors saw my canopy and went out and purchased one of their own. ConsOn of the zipper to the walls popped off but i was able to put it back on. One of the clips that holds the legs up has gotten stuck a few times but nothing major. Shipping was very fast and I received it in great condition. Fast shipping and the canopy is great quality! It's also very pretty. I work at markets and it's perfect for outside events. The carrying case is a bit heavy, but I have not had any problems with it. ProsTop canopy and walls are lined and provide great coverage from the weather. ConsThe carrying case is a bit heavy. My husband and I do craft shows and needed a new tent. We put it up so far only long enough to install the roof canopy and check out how to operate it. It went up incredibly easily, and we're both tall, so we don't anticipate any problems like the short people mentioned in their reviews. We're looking forward to using it in a show the beginning of March. We think our "set up" time will be much shorter because the poles and connection points all work so smoothly. ConsThe roof vent concerns us a bit - we would have ordered one without if we could - because if you put the tent up with it "velcroed" open, and it starts to rain, you'd have to take the whole tent down to close it! 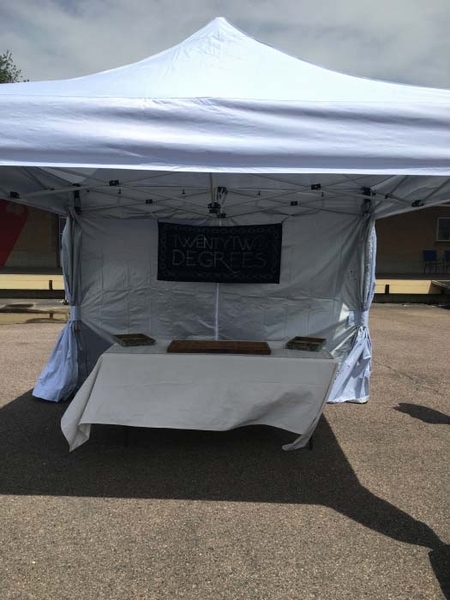 Another vendor mentioned that he had trouble keeping his velcro closed, but we decided to take a chance anyway because we really liked the looks of the tent in general. We live in Florida and hope that vent will come in handy and not be a problem. I have used this at three events and so far I've loved it. Takes two people to set up and take down; and a taller person than 5'2" to put up the sides :D The tent though looks nice and functions nice! ConsA little to tall for me to put up the sides. I need a second person to help me set up and take down the tent. Love the canopy. Its like the Cadillac of tents. Only problem my wires for the sides keep falling out. Want to order an additional canopy, but don't have time to put wires un every time I use it. Have only hung the sides once. They shouldn't be falling out. ConsWires for sides keep falling out. I saw this canopy at one of the shows I do. After witnessing how easy it was for a one person setup, I ordered it and am very happy. Very quick shipping. ProsThe curtain wall system is much easier to set up than the Velcro type and allows for a more versatile look. Very easy to put up all by myself. The underside of the canopy canvas has a reflective surface that keeps me cooler than all the other vendors at the fair. The sidewall curtains are well thought out and designed. We used this canopy for the first time last weekend, and we are so happy with it. Easy to put up, love the sides that zip. We had long time venders ask where we got it. Great value for the money. We did use scotch guard outdoor waterproofing spray on the top and it worked beautifully. I have purchased many tents over the years for my home based business. I have had them break during shows, one literally fell over. You can imagine my hesitancy at purchasing yet another. Something about the unique engineering of this tent persuaded me. I am so glad it did. I can put this tent up BY MYSELF!!!! 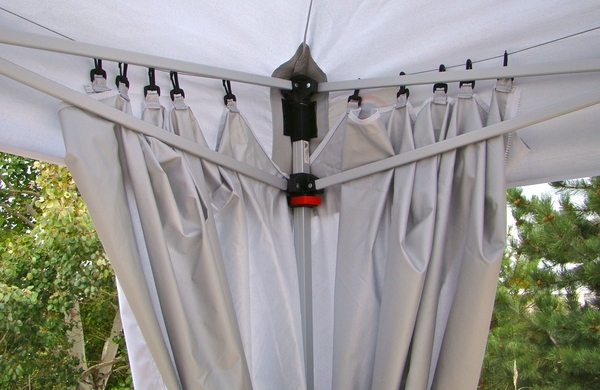 The clip on sides is so convenient and when pulled back, look like expensive drapes on the tent. The tall peak is so elegant looking. The construction is sturdier than any I have seen (or owned). The banana peel bag is a true lifesaver. Thank you for this fantastic product. We love our new canopy. Love the sides, especially the fact that they slide easily. It rained and I was so happy to have all the sides to protect my books that I sell. It is very well made and very sturdy. Well worth the extra money for this tent! ProsThe rail system with the curtains is awesome !! 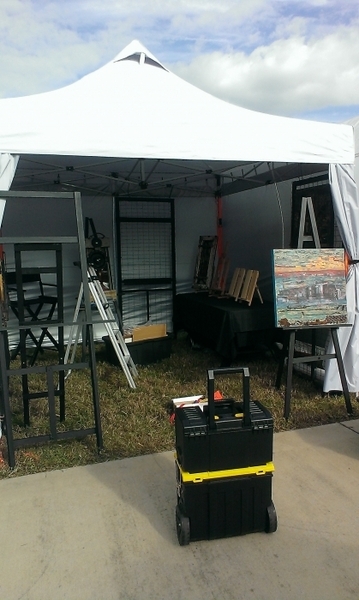 Great tent for doing art shows, sturdy frame. Very easy to put up and side walls are great. Vent in top of tent makes windy days easier! ProsSturdy Frame and professional quality, easy to attach sidewalls. ConsCording for staking was flimsy and I replaced it. We set up this tent in extremely windy conditions which made it a challenge. We had to have four people hold down the posts and guide the cover because it blew up like a parachute. In spite of that the tent was easy to set up, just not alone. It has a pretty high peak that was impressive compared to other tents at the venue. We have antique furniture and home decor which looked great with this tent because it has a more vintage look than cheaper models. We did not have time to attach the curtains but could see that they would be easy to attach. 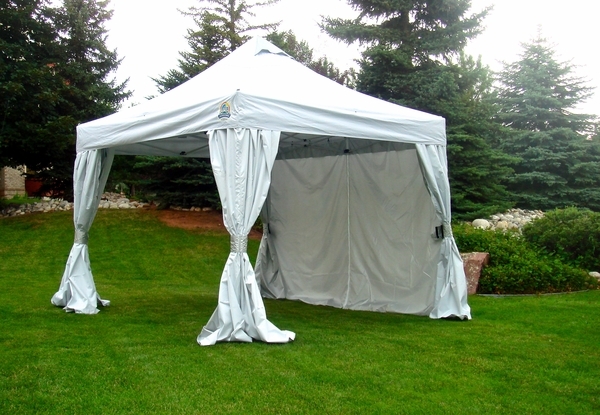 The fabric is nice and heavy compared to other tents we have used. We were happy with the tent in extreme conditions which is the biggest test for any tent. We recommend this tent! ProsNice quality, great appearance, great performance, shipped quickly. ConsWould be difficult to set up alone. Just got our new tent...and couldn't wait to use it. We were very happy with the easy setup and materials...also looked great...compared to all of our previous tents.we were pretty happy...great tent! Prosliked the materials...and structure...and the ease of the setup...great! I picked this tent out for the mechanism that holds the sides but the rest of the tent is great too. The metal is sturdy and the sides are made of a good material. I believe this will be able to withstand some wind. The UnderCover 10x10 R-2 Canopy is a easy-to-set-up tent. The tent is sturdy and the hanging side-walls are so much better than the Velcro-fastener type. The carrying case is very easy to use and transport. I just received my UnderCover R-2 Vending Package - AWESOME product, I've been an outdoor Vendor for over 20 years and this is the finest Professional Vendor setup bar none. Love the way the Walls attach like a shower curtain, why did not someone come up with this before to be used on a canopy. Thanks to this store for supplying such a wonderful product.